Home	- Arcade & Amusement Industry News	- Free New Season Edition Software Upgrade for Daytona Championship USA! Sega has just released a brand-new software update for Daytona championship USA, securing this high performing game's rightful place at the top of the income charts. Packed with exciting new features this software update takes the epic Daytona Championship USA gameplay experience to a whole new level. • Improved Car Handling – Lets players have greater control of their car and feel even closer to all the action. • New Dynamic In-Game Camera – This new feature lets players experience the race with dynamic camera angles making the gameplay feel more natural. • New Graphics and Improved Lighting – These two features combined with the dynamic in-game camera deliver a bright, crisp and modern gameplay. • New Car Models and Damage Modelling – Players can challenge their friends with new cars and witness jaw-dropping crashes and damage to cars. • New Top 3 Race Highlights – This feature brings Daytona's competitive game sprit to the front by letting players know their race position in relation to their competitors. • New Car Liveries – New liveries make all the cars look fresh attracting existing and new players. • Updated Live Player Camera – This improves the live overtake camera system, letting players show their race face and feel closer to the action! "This is truly an exciting software update, and we want all our global customers to have it as soon as possible. The software update is compatible with Deluxe, Standard and Super Deluxe models of Daytona Championship USA. We've set up a simple online form that ensures we accurately and quickly administer the right software for your game model. This software upgrade marks our continued commitment to keeping Daytona as the number one driver on location." Says Lester Travasso, Sales & Marketing Executive at Sega. 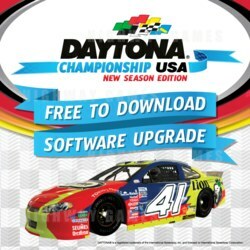 To claim a free Daytona Championship USA New Season Edition Software Upgrade simply fill in the online form and request a digital download option. Sega's technical team will get in touch with simple instructions explaining how to install the software.